Mia was born in Coconut Grove, Florida, to a family of dancers. Her father and dance teacher, Joe Michaels, taught her jazz, tap and ballet, while her sister, Dana, taught her contemporary dance. Though she began her training with members of her family, she also trained at Miami Conservatory, the Miami Performing Arts Center and Michigan’s Interlochen Arts Academy, as well as, the New World School of the Arts. Her first work experience was with her father at the Miami Dance Center, even though she began choreographing at the age of 11. She still works with her father at Joe Michaels Miami Dance Center. She has also taught dance in several schools, including the International Dance Festival of Italy, Harid Conservatory in Boca Raton, Florida, and as a guest jazz teacher at the Broadway Dance Center in NYC. She is the founder, artistic director and choreographer of RAW (Reality At Work), a critically acclaimed New York-based dance company begun in 1997. Mia’s contemporary dance company “Mia Michaels R.A.W.” has performed in Seoul, Korea, the Jazz World Congress, the International Dance Festival in Amsterdam, the Gypsy Project, Jacobs Pillow, and the New York City ’99 concert season. In 2001, the dance company went on a 6-week European tour. In 2003, she was Director of Choreography for Cirque du Soleil’s “Delirium.” She has created commissioned-work for Les Ballet Jazz de Montreal, Gus Giordano Jazz Dance Chicago, Oslo Dance Ensemble, and Rhythmek Lightbody. She’s worked for the American Music Awards, Celine Dion’s “A New Day” and “Taking Chances World Tour,” “West Side Story” and “Hello, Dolly!” on Broadway, and off-Broadway with “If These Shoes Could Talk” and “Fort Chaffee”. Her claim to international fame came in 2005 when she became a guest judge and contemporary choreographer for the “So You Think You Can Dance” competition television series. In 2009, she abruptly left the show after the auditions in New York City. In 2010, she returned, becoming the new resident judge for the show, replacing Mary Murphy. Born Richard Starkey on July 7, 1940, in Liverpool, England, Ringo Starr, known for his easy-going personality, Starr started his musical career playing percussion in a skiffle band, or a band that used common objects instead of regular instruments. His stepfather supported his interest in music and reportedly bought him a drum kit. Starr met the members of the Liverpool group, the Beatles, in Hamburg, Germany, in 1960. Two years later, he was asked to join the Beatles to replace their current drummer. Starr was soon on the fast track to success with his new bandmates Paul McCartney, John Lennon and George Harrison. With their floppy hair and matching suits, the Beatles crossed the Atlantic Ocean to launch their own pop invasion of America in 1964. Beatlemania was in full force during their first U.S. television appearance on The Ed Sullivan Show. Their single, “I Want to Hold Your Hand,” had already climbed to the top of the charts before the taping and was followed by a succession of hits. And throngs of screaming fans—many of which were love-struck teenagers—filled the audiences of their live shows. In addition to recording, Starr was flourishing in other creative directions at this time. He directed and produced the documentary, Born to Boogie (1972), on influential glam rockers T-Rex. Continuing to act, Starr appeared in such films as 200 Motels (1971), That’ll Be the Day (1973) and Son of Dracula(1974). He also starred in the comedy Caveman (1981) with Barbara Bach, and the two soon fell in love and married. Starr reteamed with Paul McCartney for the musical drama Give My Regards to Broad Street (1984). On television, he starred in two children’s series as the narrator for Thomas the Tank Engine and later Shining Time Station. Starr emerged as a bandleader in the late 1980s, touring with the first incarnation of his All Starr Band, which included Joe Walsh from the Eagles, Nils Lofgren and Clarence Clemmons from Bruce Springsteen’s E Street Band, Rick Danko and Levon Helm from the Band, and Billy Preston and Dr. John among others. Starr received some his strongest reviews in years for 1992’s Time Takes Time. 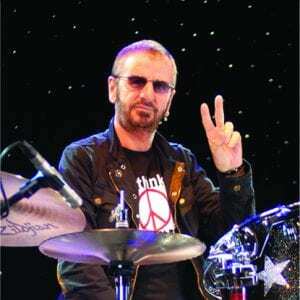 He also was involved with an interesting reunion with Paul McCartney and George Harrison in the mid-1990s. The trio worked with a demo version of the song “Free as a Bird” recorded by John Lennon in 1977 to produce a new Beatles single—the first in 25 years. In 2013, Starr showed off his talent for photography. He publishedPhotograph, which featured many never-seen-before images of the Beatles. According to The Hollywood Reporter, Starr felt that the photo book could tell the story of his life as a Beatle better than a traditional autobiography.